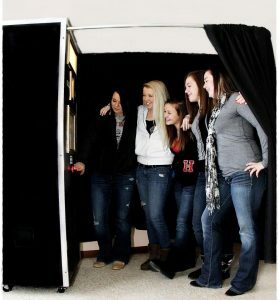 This is our most popular photo booth and will provide your guests with hours of entertainment! It’s very lightweight and can be placed anywhere inside and outside. All we need is a 120V outlet and about a 7ft by 3ft space. One of our friendly attendants will take care of helping your guests with the booth and making sure they have a good time. It’s all about the fun!